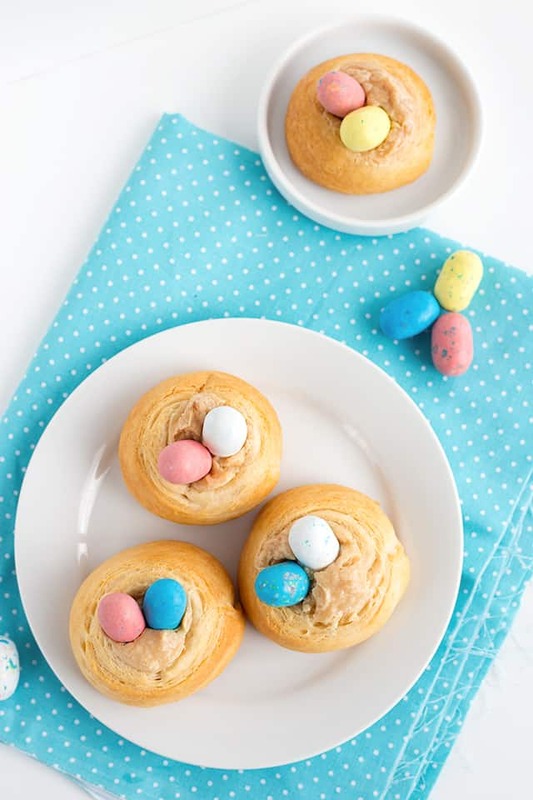 Need a cute Easter breakfast? These malted milk cheese danishes are loaded with the malted milk flavor that we’re all familiar with. They’re a great semi-homemade easy that’s quick to whip up. The crust is flaky and the center has a creamy malted milk cream cheese stuffed inside. 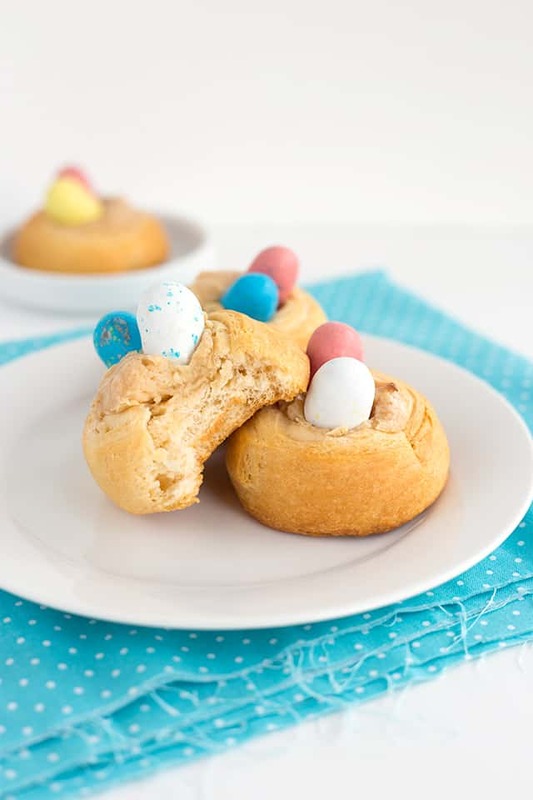 I added a couple malted milk egg candies to make these danishes extra festive. Thank you Pillsbury™ for sponsoring this post. All opinions are my own. Easter is coming right up and I’m so ready to get some pastel colors up on the blog. 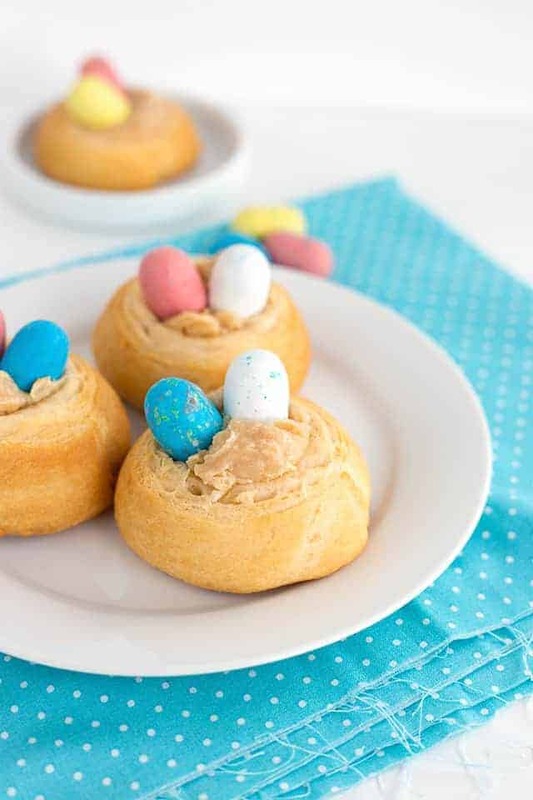 I’m kicking it off with a tasty crescent roll cheese danish loaded up with malted milk powder, cream cheese, and a couple adorable speckled malted milk eggs. I’m a long time lover of crescent rolls even though I literally never use them as crescent rolls. It all started with my blueberry cream cheese danish with crescent rolls recipe. That recipe is amazing if you are a lover of blueberries, cream cheese, and a flaky crust. I also made pecan pie cheesecake bars with crescent rolls and man oh man that makes me weak at the knees. The best part is that Walmart sells them in the 2 packs. For whatever reason, most of my recipes always involve two tubes of crescent rolls. I also love grabbing cinnamon rolls there since my son loves them for a Sunday morning breakfast. Back to the recipe at hand! My favorite part was cutting the roll of crescent rolls. Use a sharp serrated knife, folks. It will make it so much easier for you. I didn’t unroll them either. I carefully pulled them out of the tube to make sure none of the triangles were separated from the roll and laid it on some wax paper. Here’s my pro tip to getting sort of even pieces without a ruler. I make the first cut in the middle of the roll. Then I make a cut in the center of the two pieces. Then I make a cut in the center of the four pieces and there you go! I do break out the ruler to attempt to get even bars and brownies which NEVER works for me. My ruler almost always shifts when I’m marking out my cuts. After you have your slices, press down the center of each slice to give you a little hole to add your malted milk cream cheese in. You can flatten out the slices a little bit, but I found that it just puffed back up after baking. I left 1 – 2 rings of dough and pressed the rest down to form a little cavity. After they’re filled and baked, I added little candy malted milk eggs to them. You can skip them if you don’t feel like being festive and adding a little sweetness to your cheese danish. These are the perfect Easter breakfast. These danishes are crescent rolls stuffed with a malted milk cream cheese and baked until golden brown. 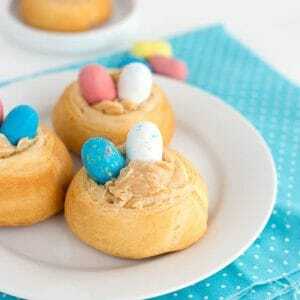 Afer they're baked up, add 2 malted milk egg candies to the top! In a large bowl, add the cream cheese, malted milk powder, and sugar. Beat with a hand mixer until smooth and creamy. Add the vanilla extract and sour cream. Beat until combined. Scrape down the bowl and stir to incorporate any remaining bits that need mixed on. Set aside. Remove the crescent rolls from the tube without pulling the dough apart. Place on a piece of wax paper or parchment paper and cut them in 8 slices. Repeat with the second tube of crescent rolls. Lay the slices on their side on the prepared baking sheet. Press the centers down on each slice. Leave the outer 1 - 2 layers of dough. Fill the holes with the malted milk cream cheese mixture with about 1 teaspoon of filling. Feel free to add more or less depending on your desired amount of filling. Place into the oven and bake for 15 minutes until the crescent roll dough is golden brown. Pop the malted milk candies in the cheese filling. Oh these are so cute! Can’t wait to make them for Easter! THese are so cute! I can’t wait to try!